It’s about time to let go of items in my closet. Following good examples on Facebook I will be uploading pictures of (tango) shoes and (tango) clothes that I would like to sell. Some of them are brand new, others have rarely been worn and are in very good condition. Most items are size S or M (German size 38 or 40), but some differ. See description of items. 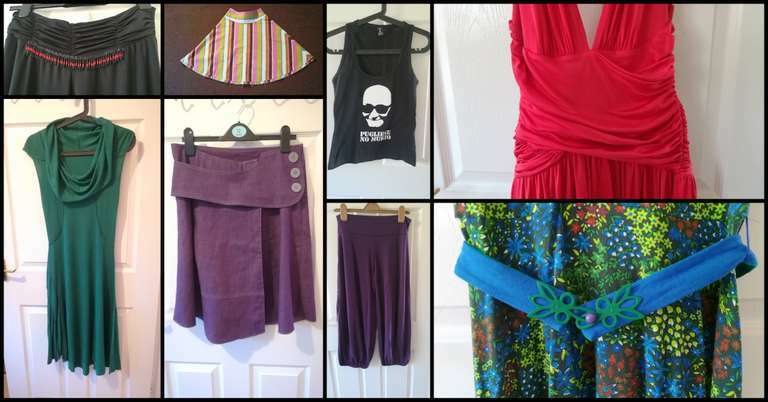 You’ll find more pictures of those items in my Facebook Photo Album – Bärbel’s (Tango) Clothes & Shoe Sale. For the tango shoes please check out this post: Argentine Tango Shoes For Sale. I will bring these items to The Magic Roundabout Milongas in the UK. Contact me in advance if you want me to bring the clothes and tango shoes to my group classes (Tango & Feldenkrais) in Lydney, Newland & Parkend (the Forest of Dean, Gloucestershire). Please contact me via email, if you are interested. I am travelling as Tango DJ through Europe and could bring a few items with me. Check my DJ Agenda for my upcoming Tango DJ sets. You’ll find the prices in GBP and EUR in the description of the pictures. You are welcome to make an offer! If you are interested in one or more items please contact me directly via info (at) movingexperience (dot) eu.